Dulcis Inn River House v Řím, Itálie: Zarezervujte nyní! For a quick break or a longer stay to discover Rome , Dulcis Inn River House welcomes you in a bright environment , relying on a wonderful romantic terrace relaxation will be guaranteed. Come and enjoy out guesthouse! 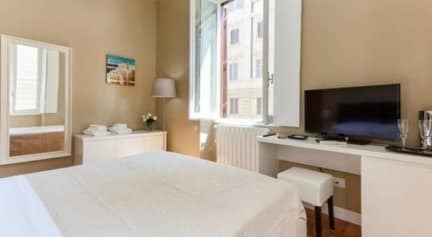 Offering a terrace and views of the city, Dulcis Inn River is set in Rome, 1.1 km from Villa Borghese. Villa Torlonia is 1.1 km from Dulcis Inn River, while Piazza Barberini is 1.2 km away. Rome Ciampino Airport is 15 km from the property. Each room at this guest house is air conditioned and is equipped with a flat-screen TV with satellite channels. There is a shared kitchen at the property.